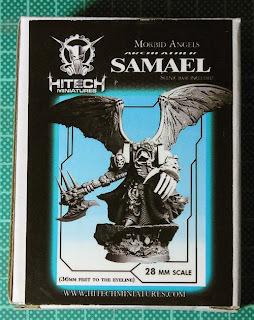 We've seen the pictures of the finished Samael model, now here's my review of this kit. 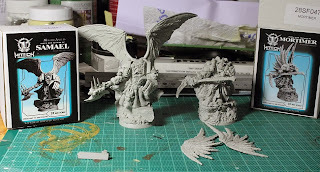 The models come in a sturdy cardboard box (9cm by 7cm by 5cm ) with some pieces in a plastic baggy, the rest loosely in the box. 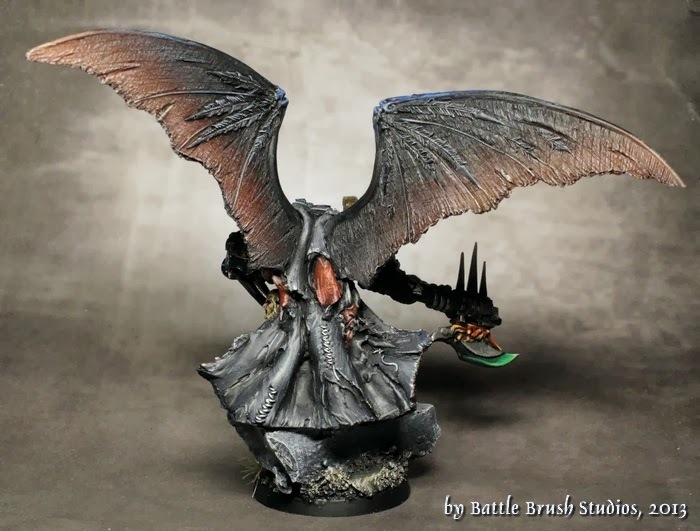 The models come with a custom plinth-like scenic base with a round foot of ...well, 3.7 to 4cm diameter. So not a perfect circle. 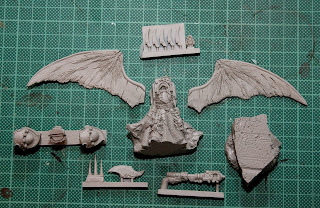 Lightning claw "fingers", wings, Body, a sprue with the shoulder parts, one for the axe blade and spikes, axe handle and the base. No mould lines what so ever. I'm always impressed with what people can cast in one piece and from one mould in resin. However, there are some slight miscasts on the robe. Hardly noticable though, given the style the robe is sculpted. There were a few air bubbles in annoying places like as holes in tubes and such which required filling, but nothing horrifyingly hard to fix. Speaking of style: These models do have a very surprising sculpting style. I'm still trying to get behind it. It's this mix of chunky, blocky parts along with robes and details wrapped around them sculpted in a way that's very organic, wild and frayed. 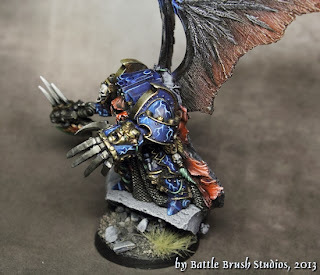 Imagine John Blanche sculpting a tattered robe. 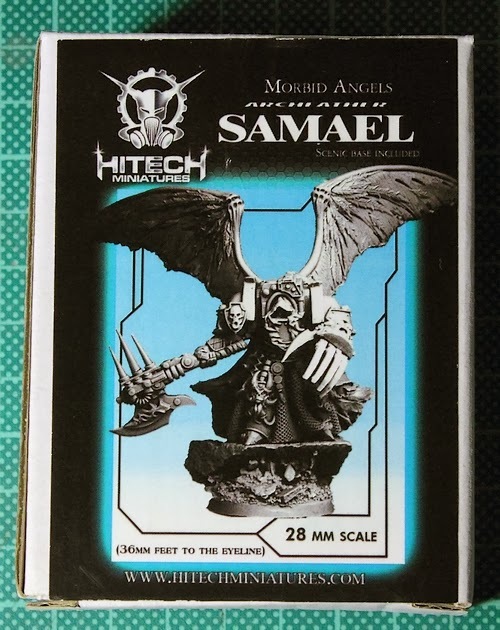 It reminds me of Scibor's early sculpts, back when all he had was this sheet-stencil and ...well, the rest wasn't too top quality sculpting if you recall. Here's a top shot of the torso which I hope illustrates what I mean. You see the demurely detailled top along with the fuzzy, wild robes. 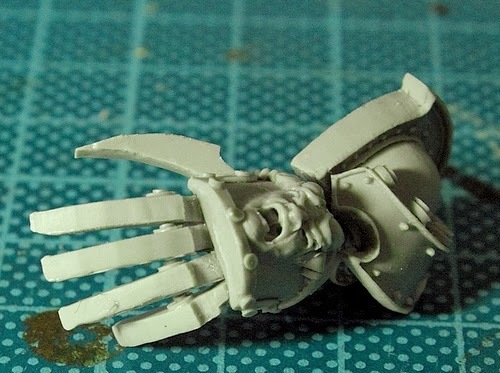 In the above picture you can see the assembled left arm with the Lightning Claw. What should be blades is more like solid, curved quare pieces, more akin to a Power Fist's fingers. The curved outsides of the pieces also aren't perfectly smooth but consist of three to four straight bits at slight angles to give you the impression of a smooth, curved surface. Think polygon graphics. 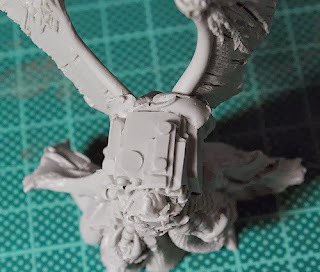 This is what I think is the core behind this: computer-sculpted figures with sculpted greenstuff robes and bits around them. Wings might be hand-sculpted as well. 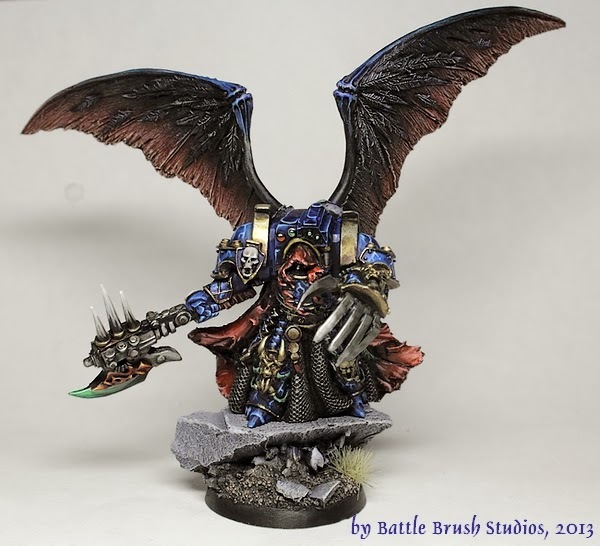 Mind you, this is just my theory but it would explain the schizophrenic appearance of the sculpting on these models. This is because you have to glue a few loose feathers to his wings to make them look more three dimensional and whatnot. This is a bit outside of the boundaries of this review but I wanted to mention it. 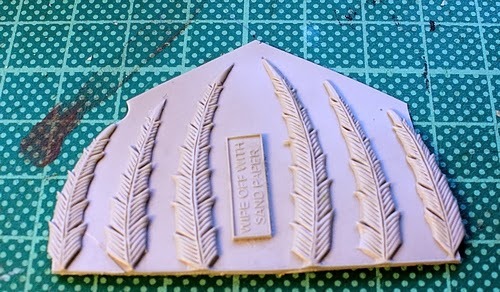 You get two of these sheets with eight feathers each (cut two off the thing in the picture). Not a problem with the first but with the pictured one I'm sure youcan see the problem. At the thickest point it was close to 3mm thick which meant quite a lot of filing and sanding to make the feathers work. As you can see, these guys are huge. 36mm from foot to eye level a staggering 105mm from the foot of the base to the top point of the wings. These models certainly are servicable. 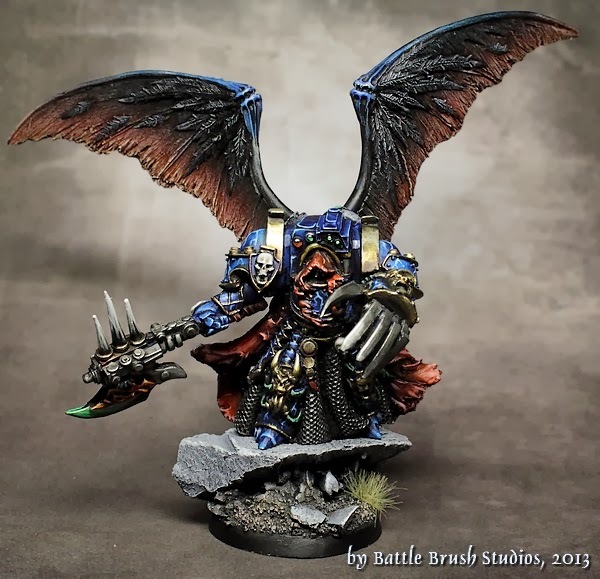 If you want a primarch model, a daemon prince (you can definately tell which models from their range have a more chaos-y vibe to them and which don't) or an extra impressive leader for your (Chaos) Space Marines army, you can safely go with HiTech Miniatures models. 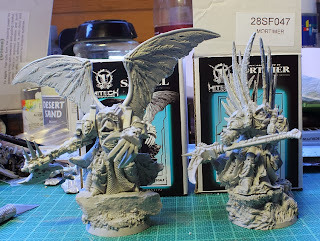 The casting is of high quality, the pieces go together well (no pinning was used when i asseumbled the models and hardly any green stuff was required) and the presentation bases are a very cool touch. The style of the sculpting is what I'm on the fence about. Not necessarily because it's bad, it's just so schizophrenic and the robes on both models I'm working with lack definition. It's not that they look bad or hastily glued on sheets of GS what were fuzzed up at the borders. It's just unusual. I have to admit that it didn't quite win me over yet but I certainly won't hold it against anybody if they said that they did like it a lot. In a way it works very well to distinguish synthetic parts like armour from more natual parts like cloth, leathery wings and so on. To me, the divide is a bit harsh (and the weapons are very chunky). 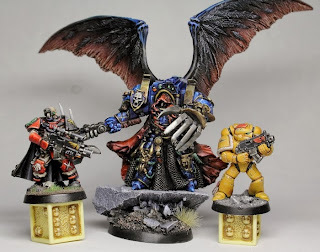 All that being said, They are good quality models. 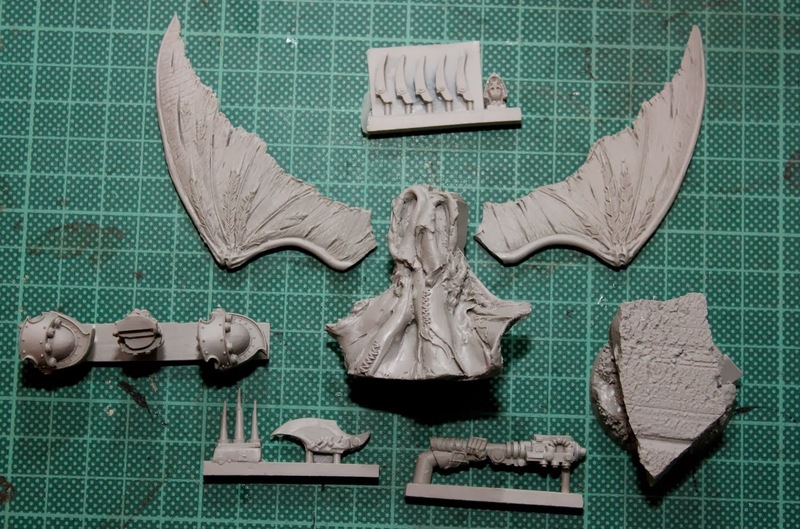 You might have to do some scraping, filing and cutting but this is to be expected with resin kits. At €25,00 a piece the models aren't cheap but given the size, the scenic base and the quality well worth the money. If you like the style of the models and you're on the lookout for alternative Primarchs or Space Marine characters, HiTech Miniatures are for you.